98% of British turn down free money! 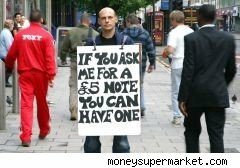 Recently a price comparison site, moneysupermarket.com, took to the streets of Britain and tried to give away free money. Despite standing on two busy streets, being passed by over 1,800 people only 28 people took advantage of the free bill, worth roughly $10 USD! The company running the money parade took to the streets to show that most British won't take simple steps to improve their financial situation even during a hard economic period. Despite this taking place in Britain, I would venture to guess that the point is still the same here in states. It is relatively easy to cut back or to take small steps to save money, but many people don't even take the smallest steps. Some of the examples the articles lists are to move any savings to a high yield savings account or to stop sending out so many credit card applications, both of which are applicable to us in the U.S. even though many people don't do either. The article provides a lot of British-centric advice for saving money but like those items I already mentioned most of the principals transfer over to Americans. I'm always leery of a "survey" done with an end result in mind, and honestly the gentleman passing out the fivers does look a bit intimidating, but on a more important note. Don't we all have a built in BS filter when we see a free money sign? Polling of those who passed by revealed that 60% thought it was a trick or a con, and thank God, otherwise I would suggest all the spammers and con men of the world descend on Britain. We have been so conditioned to look at free money or get rich quick schemes with doubt that when a man wearing a sandwich board really does want to hand over his cash to you, you avoid him like you do a rabid raccoon!